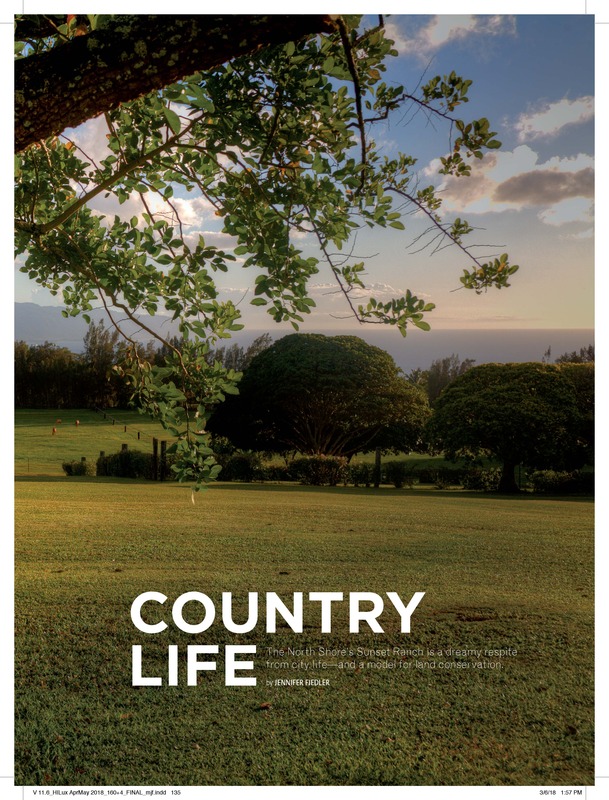 THE NORTH SHORE OF O‘AHU IS KNOWN FOR ITS WORLD-CLASS WAVES, PHOTO-READY BEACHES, AND WIDE OPEN SPACES… AND GREG PIETSCH, owner of Sunset Ranch, which sits high on top of Pupukea overlooking the ocean, wants to keep it that way. Fast forward through a tricky two-year approval process—these type of grants had never been utilized in Hawai‘i—and Pietsch set out to run the ranch as a four-pronged outfit. The events department— perhaps the most visible operation— throws everything from weddings to private dinners to wellness tours on the expansive property. Horsemanship programs, with an emphasis on therapeutic and leadership-building experiences with groups such as Wounded Warriors and HUGS, make up another element. Farming and native forest restoration in collaboration with Waimea Valley Park round out the offerings. The last eight years have involved some recalibration on Piestch’s part. A planting of 800 coffee seedlings failed. Overcoming tropical pests for in-ground farming proved challenging. But other opportunities not originally in his business plan, such as an 60-tree avocado orchard, a native fern restoration plot, and an aquaculture pond for tilapia, are now thriving.